Pre-AIA 37 C.F.R. 1.175 Reissue oath or declaration. (2) All errors being corrected in the reissue application up to the time of filing of the oath or declaration under this paragraph arose without any deceptive intention on the part of the applicant. (ii) In order to overcome a rejection under 35 U.S.C. 251 made by the examiner where it is indicated that the submission of a supplemental oath or declaration as required by this paragraph will overcome the rejection. (2) For any error sought to be corrected after allowance, a supplemental oath or declaration must accompany the requested correction stating that the error(s) to be corrected arose without any deceptive intention on the part of the applicant. (c) Having once stated an error upon which the reissue is based, as set forth in paragraph (a)(1), unless all errors previously stated in the oath or declaration are no longer being corrected, a subsequent oath or declaration under paragraph (b) of this section need not specifically identify any other error or errors being corrected. (d) The oath or declaration required by paragraph (a) of this section may be submitted under the provisions of § 1.53(f). 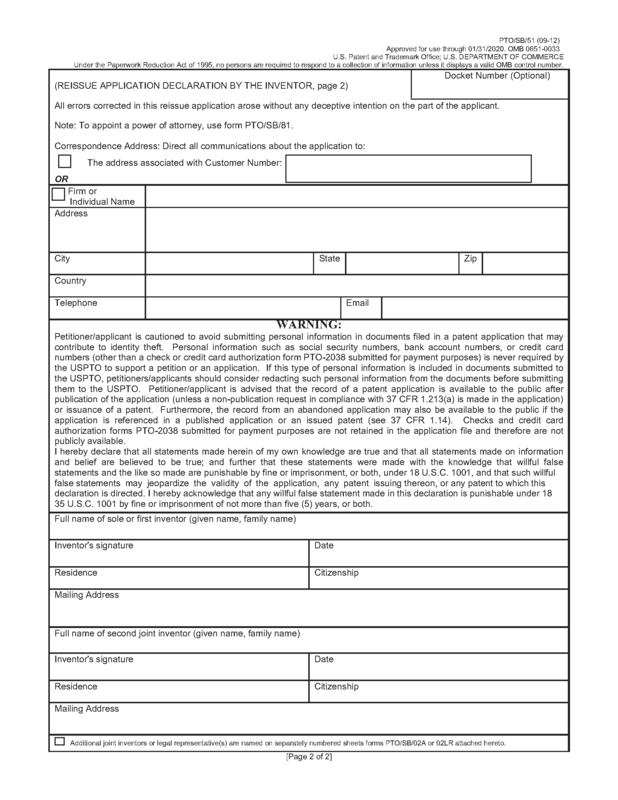 (e) The filing of any continuing reissue application which does not replace its parent reissue application must include an oath or declaration which, pursuant to paragraph (a)(1) of this section, identifies at least one error in the original patent which has not been corrected by the parent reissue application or an earlier reissue application. All other requirements relating to oaths or declarations must also be met. 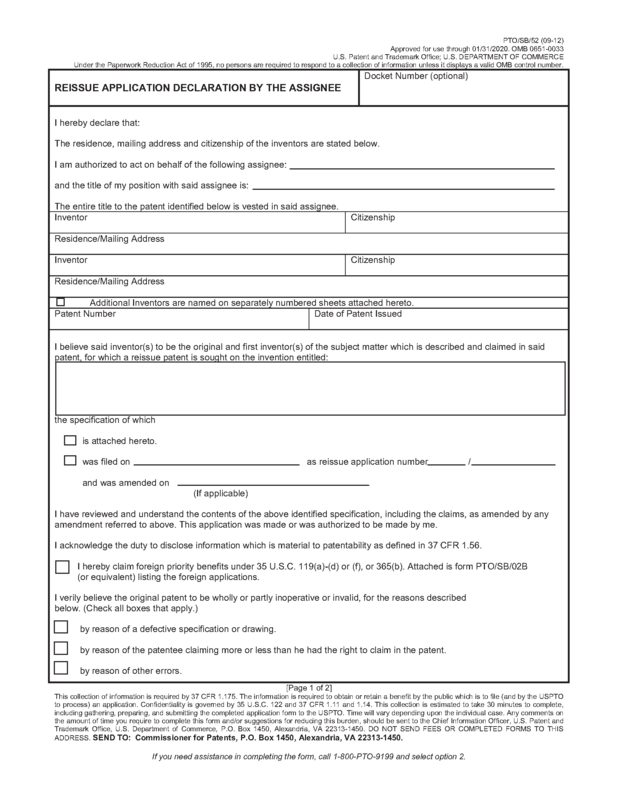 "All errors corrected in the present reissue application up to the time of signing of this oath/declaration, or errors which are being corrected by a paper filed concurrently with this oath/declaration which correction of errors I/we have reviewed, arose without any deceptive intention on the part of the applicant." Nothing more is required. The examiner will determine only whether the reissue oath/declaration contains the required averment; the examiner will not make any comment as to whether it appears that there was in fact deceptive intention (see MPEP § 2012). It is noted that a reissue oath/declaration will not be effective for any errors which are corrected by a filing made after the execution of the reissue oath/declaration, unless it is clear from the record that the parties executing the document were aware of the nature of the correction when they executed the document. Further, a reissue oath/declaration with an early date of execution cannot be filed after a correction made later in time, to cover the correction made after the execution date. This is so, even if the reissue oath/declaration states that all errors up to the filing of the oath/declaration arose without any deceptive intention on the part of the applicant. Form paragraph 14.01.04.fti may be used where the reissue oath/declaration does not provide the required statement as to "without any deceptive intention on the part of the applicant." ¶ 14.01.04.fti Defective Reissue Oath/Declaration in Application Filed Before Sept. 16, 2012, 37 CFR 1.175- Lack of Statement of "Without Any Deceptive Intention"
The reissue oath/declaration filed with this application, which has a filing date before September 16, 2012, is defective because it fails to contain a statement that all errors which are being corrected in the reissue application up to the time of filing of the oath/declaration arose without any deceptive intention on the part of the applicant. See pre-AIA 37 CFR 1.175 and MPEP § 1414. 1. 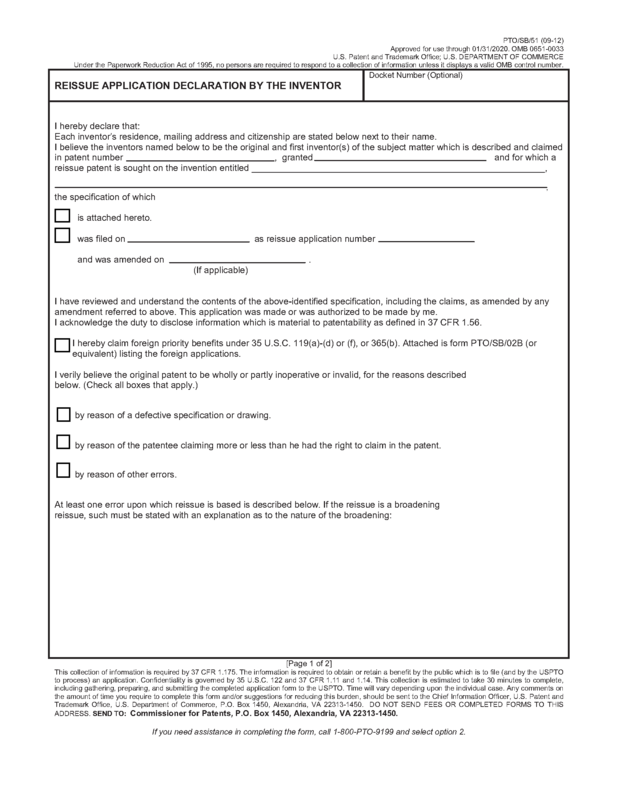 For reissue applications filed before September 16, 2012, use this form paragraph when the reissue oath/declaration does not contain the statement required by pre-AIA 37 CFR 1.175 that all errors being corrected in the reissue application arose without any deceptive intention on the part of the applicant. 2. 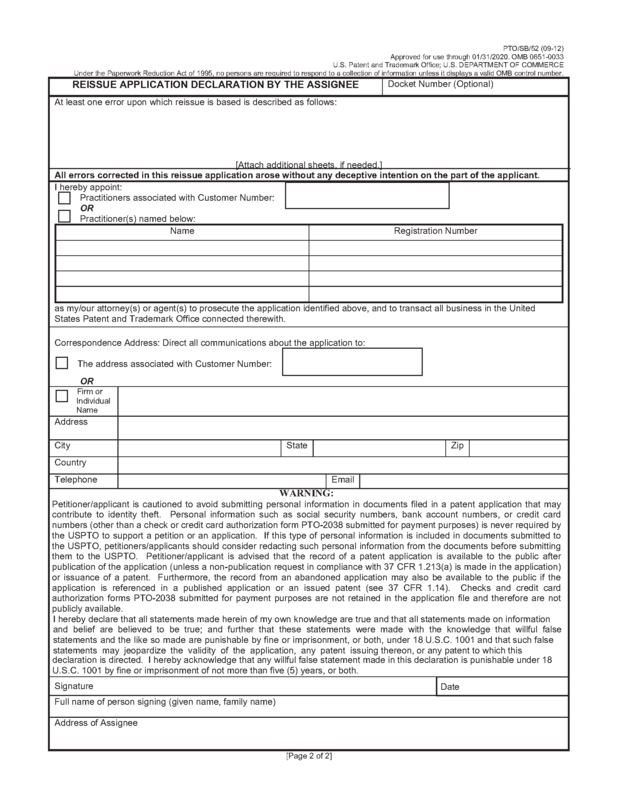 This form paragraph is appropriate to use for a failure by applicant to comply with the requirement, as to any of pre-AIA 37 CFR 1.175(a)(2), 37 CFR 1.175(b)(1), or 37 CFR 1.175(b)(2). 3. Form paragraph 14.14 must follow. The Office of Patent Application Processing (OPAP) should review the reissue oath/declaration for compliance with pre-AIA 37 CFR 1.63; thus, the examiner is not required to do such review. 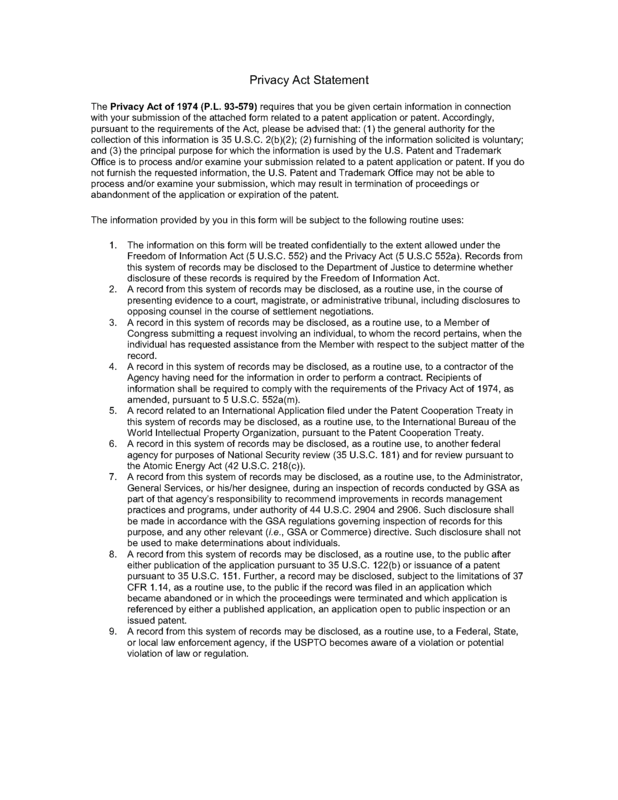 (C) acknowledge the duty to disclose to the Office all information known to the person to be material to patentability as defined in 37 CFR 1.56. See also the discussion regarding the requirements of an oath/declaration beginning at MPEP § 602. See MPEP § 1414.03 for a discussion of the requirements for a supplemental reissue oath/declaration. Depending on the circumstances, either form PTO/SB/51, Reissue Application Declaration By The Inventor, or form PTO/SB/52, Reissue Application Declaration By The Assignee, may be used to prepare a declaration in a reissue application.